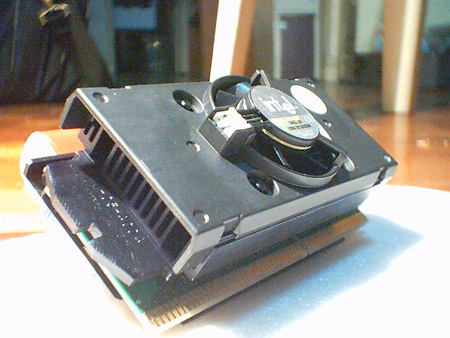 I picked up an Intel Pentium III 700 processor from Villman to see what I could do with it. As you can see, it's in Slot-1 SECC2 format which should bare the advantage when it comes to overclocking due to the bigger coolers you can use with it. It runs on a 100Mhz. bus, a 7.0x multiplier, and it's default voltage is set at 1.65V. It certainly looks as if Intel is doing a little overclocking of their own since we all know the specification voltage for a Coppermine processor should only be at 1.60V. 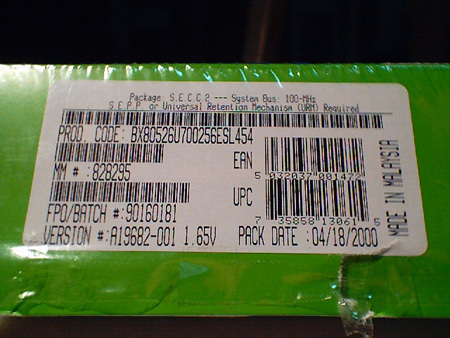 Those are the product codes for my processor. You'll see that it has the new S-Spec so it uses the cb0 stepping. You can verify this from here.